With Oliver now officially hired on with the SCPD, he's ready to focus on helping the police to save the city and start repairing his troubled relationship with Felicity. But when Dinah puts him in charge of tracking down the new Green Arrow, things take a surprising turn. Meanwhile, Lyla and John are brought to task by the Deputy Director of ARGUS for their approaching Ricardo Diaz with a plea bargain. Why is Curtis willing to help Rene and Emiko? Everything we've seen in previous episodes suggests he was glad to get vigilantism behind him and was scared of being arrested. Sea Shimooka has an impressive first turn as Emiko Queen, immediately making her into a sympathetic protagonist. Two names on Emiko's list of people who were involved in her mother's death are shout-outs to characters from the Green Arrow comics. The first, Nicholas Kotero, was a serial killer who was the first villain Green Arrow fought in the post-Zero Hour timeline in Green Arrow Annual #7 in January 1995. The second, Scott Notting, was a corrupt Seattle police officer, who led the villainous gang known as The Vice Squad in Green Arrow #12 in February 2017. The name William Glenmorgan may ring a bell with some comic fans. It is the full name of Congo Bill - a DC comics Great White Hunter jungle comics hero in the Golden Age, who was revamped into the superhero Congorilla after William Glenmorgan was given a ring that allowed him to swap minds with The Great Golden Gorilla. When Emiko confronts Glenmorgan about why she hunted him, he says he couldn't have killed her mother because he spent the last two years on an undercover mission in Santa Prisca. In the DC Universe, Santa Prisca is an island nation, home to an infamous prison where the Batman villain Bane was born. William writes a targeted search algorithm that can use the Archer Program to search Star City for bombs. Emiko Queen: The world is not a fair place. Innocent people die while the guilty go free. The system is broken, filled with corruption, greed and apathy. The people who are supposed to protect us are failing us. Criminals continue to walk the streets because no one is willing to stop them. The world may not be fair, but everyone deserves justice and someone looking out for them. Dinah: Game time, rookie! You ready? Oliver: This isn't my first crime scene, Dinah. Dinah: (beaming) No, but it's your first one as an SCPD Deputy, so try not to screw it up, huh? Rene: Look, you're doing a lot of good out there. And you obviously care about The Glades. Let me help you. Emiko: You have no idea what I care about. Rene: If Oliver Queen knew anything, it's that you can't save the city alone. Emiko: I'm not Oliver Queen. Felicity: Some husbands bring their wives home flowers and mine brings me blood from a crime scene. And they say romance is dead. Emiko: People say that revenge corrupts the soul. That if you go down that path, you'll never come back. But sometimes embracing the darkness is the only way to get justice. My name is Emiko Queen. I will get justice for my mother. And no one will stand in my way. Emiko Queen has a list of evildoers, much like the one Oliver Queen had as The Hood. Oliver is now officially a Deputy with the SCPD. 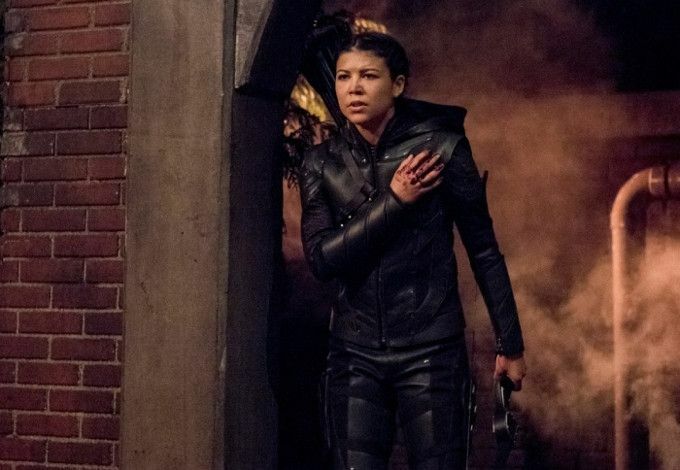 Emiko Queen has a contact named Marco with one of Star City's gangs, who gives her information on William Glenmorgan. William Glenmorgan has been hired for a few sensitive jobs, along with the Bratva and Irish mobs. He's currently in Star City contracting with Talis Global Security. According to Rene, Talis Global Security is a disreputable firm that recruits Navy SEALS, mercenaries and assassins for various covert jobs. Emikio goes to Rene Ramirez after she is shot in the shoulder while escaping Talis Global Security. According to Dinah, the new Green Arrow has been leaving felons on her doorstep almost every night for a while. The trace of blood on the broken glass which Oliver finds is the first solid lead they've had as to the new Green Arrow's identity. Rene is capable of stitching up a bullet wound on his own. Lyla has spent three days trying to get Diaz to talk about Dante and his organization. Lyla says that Dante paid off Ricardo Diaz's debt to The Longbow Hunters. Felicity rigs up a DNA scanner on the door of her and Oliver's new apartment that tells her if who is entering the apartment matches her list of approved people. Oliver says that Roy Harper is on another continent when Felicity asks if Roy might be the new Green Arrow. Felicity runs a DNA test and determines that the new Green Arrow is a woman who shares some of Oliver Queen's DNA on his father's side and that it isn't Thea Queen. Felicity determines theirs no records of Robert Queen having another daughter anywhere in the USA. Felicity refers to the events of Elseworlds and Oliver fighting alongside Batwoman. Robert Queen used an off-shore account to handle some of his more sensitive financial transactions. Felicity tracks a series of transactions to M&H Storage in Orchid Bay. The account is still active but, curiously, the account is registered in Moira Queen's name. John Diggle offers to let Diaz go free if he can deliver Dante to ARGUS. John proposes reactivating The Ghost Initiative - an ARGUS program employed expendable criminals for covert operations. It was originally shut down after the death of Amanda Waller in 411. Emiko sends Rene Ramirez a message on an arrow, asking him to meet her at 23 Cedarhurst Avenue. Oliver discovers a letter from his father to Walter Steele, in which he confesses loving a woman besides Moira and having a daughter with her. He asks Walter to take care of the daughter and do right by her. Kazumi Adachi was the name of Emiko Queen's mother. Oliver concludes that his mother found the letter and hid it from Walter after discovering Robert's second secret family. Emiko lived with her mother in The Glades all her life. She says she and her mother were given a box by Robert Queen containing a quilt. They used the quilt to make a fort to play in when she was a girl. Kazumi Adachi was killed by William Glenmorgan. Emiko determined this by tracking the specific make of bullets Glemnorgan used. Rene recognizes the other names on Emiko's crime-board. They include Jon Cortez from 704 and Jason Stent from 701. Respectively, they were the arsonist who tried to cover up Kazumi Adachi's murder by burning her apartment complex and Jason Stent was the arms dealer who sold the rifle that killed her. Glenmorgan has a compound outside of Star City. Rene asks Curtis to help him and Emiko with taking out the security system on Glemorgan' compound. Glemorgan glaims to not be a gunman. Glenmorgan claims he was set-up, having been in Santa Prisca for the last two years on a covert mission and that he just got back into the USA one month earlier. Rene offers to help Emiko keep looking for her mother's killer. Felicity encourages Oliver to reach out to Emiko and welcome her into his life. Ricardo Diaz has a bomb and tracker implanted in the back of his head. The episode ends with Oliver approaching Emiko at their father's grave. In the future of 2038. Rene Ramirez is the mayor of The Glades (which is now a separate city from Star City) and credited as the man who single-handedly cleaned up that part of town. Zoe Ramirez is her father's chief of staff and has been out sick for three days. The Archer Program is a city-wide security system that keeps The Glades safe. Rene says that The Archer Program fell into the wrong hands once and the city barely recovered. Rene refuses to let The Archer Program be used to help stop the bombings in Star City. Dinah is easily able to sneak up on Rene. Dinah shows Rene the bombing plan they found in Felicity's lair. Rene says that Felicity became a criminal, but is stunned by the news she is dead. Rene, Dinah, Roy, Diggle, Oliver and Felicity were the six heroes who got The Mark of Four tattoo and reminds him of their promise to each other. Rene threatens to have Dinah arrested if he sees her again. She in turn threatens him, saying that the last time they saw each other it didn't end well for him. Dinah says she still believes Rene to be a good man, even if he has lost his way. Rene is revealed to be working with a man who is a part of the bombing plot. Rene informs the man that The Canaries know about plot but says there might be another way to achieve their goal. The man dismisses this saying Star City is a cancer and the only way to deal with a cancer is to destroy it. The man admits to knowing Felicity Smoak was killed and describes her as a liability to be dealt with. A surprisingly solid episode despite nothing about it standing out. The script is pretty basic and more concerned with introduction and information than sparkling dialogue or stunning twists. Then again, given how badly Arrow has flubbed its grand gestures in Season 7, this is a welcome change. It may not be the most memorable episode ever but it does a fine job of establishing the new status quo.